Credit Card as a security deposit & ID per each memeber of the group is required. Welcome to the Whitsundays! Magnums is a tropical oasis in the middle of the excitement of Airlie Beach. Relax in our beautiful settings or take a short stroll to the famous Airlie Beach Lagoon, Abel Point Marina, or Port of Airlie. Magnums is an over 18 years only budget holiday retreat in the heart of the beautiful Whitsundays. Our Reception is open from 7.00am to 9:00 pm - check in is available between 2.00pm and 8.30pm. •You are welcome to store your Luggage with us for FREE until your room is available. •If you are going into share accommodation (dorms) please be advised that these rooms are the last rooms to be visited by our Housekeeping Department so if you do not wish to go into a room that has not been fully serviced we may have to wait to check you in as late as 3.30pm. No need for a cab - Magnums is within walking distance to all of the fantastic restaurants, pubs and nightclubs Airlie beach has to offer. 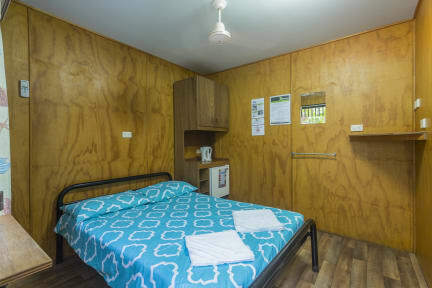 Our affordable accommodation styles include dorm rooms, deluxe cabins and private rooms which are all surrounded by beautiful tropical gardens. All of our rooms have air-conditioning and ceiling fans for your comfort. Professionally cleaned linen is provided and our rooms are cleaned daily by our friendly in-house housekeeping team. Our new kitchen and recreation room is now open! Our kitchen offers facilities including microwaves, toasters, kettles and all your basic kitchen needs. Our recreation room has a 51 inch PLASMA TV, games and free WiFi for your enjoyment - it is the perfect Whitsunday indoor entertainment room! Get some friends together or make some new ones and enjoy a game of volleyball on our sun-filled volleyball court. Want to venture out on a daytrip or an overnight sailing adventure and discover what the Whitsundays has to offer? Magnums has a fully accredited tour desk within our reception area with a large range of tours and activities at very competitive prices. Book your tours at Magnums and ask about staying with us for free. It is look like a village, so much cool! The hostel is nice, rooms ok...but the shower was terrible!!! This hostel is well located. I think you could improve kitchen installations (too hot) and do something about insects that can come to the room, as in my case. Barhrooms could be better and people at the reception could be more friendlier and welcoming.